Last week George Selgin warned us (the Market Monetarists) about getting to excited about the recent actions of the Federal Reserve. Now fellow Free Banker Larry White raises a similar critique in a post on freebanking.org. I have already in an earlier post addressed these issues. I agree with Bill (and George Selgin) that it potentially could be a disaster for central banks to target real variables and that is also why I think that an NGDP level target is much preferable to the rule the fed now seems to try to implementing. Both Larry and George think that the continued weak real GDP growth and high unemployment in the US might to a large extent be a result of supply side problems rather than as a result of demand side problems. Eli Dourado makes a similar point in a recent thoughtful blog post. Bill Woolsey has a good reply to Eli. To me our disagreement is not theoretical – the disagreement is empirical. I fully agree that it is hard to separate supply shocks from demand shocks and that is exactly why central banks should not target real variable. However, the question is now how big the risk isthat the fed is likely to ease monetary policy excessively at the moment. In my view it is hard to find much evidence that there has been a major supply shock to the US economy. Had there been a negative supply shock then one would have expected inflation to have increased and one would certainly not have expected wage growth to slow. The fact is that both wage growth and inflation have slowed significantly over the past four years. This is also what the markets are telling us – just look at long-term bond yields. I would not argue that there has not been a negative supply shock – I think there has been. For example higher minimum wages and increased regulation have likely reduced aggregate supply in the US economy, but in my view the negative demand shock is much more import. I am less inclined to the Austrian misallocation hypothesis as empirically significant. A simple way to try to illustrate demand shocks versus supply shocks is to compare the development in real GDP with the development in prices. If the US primarily has been hit by a negative supply shock then we would have expect that real GDP to have dropped (relative to the pre-crisis trend) and prices should have increased (relative to the pre-crisis trend). On the other hand a negative demand shock will lead to a drop in both prices and real GDP (relative to pre-crisis trend). The graph below shows the price level measured by the PCE core deflator – actual and the pre-crisis trend (log scale, 1993:1=100). 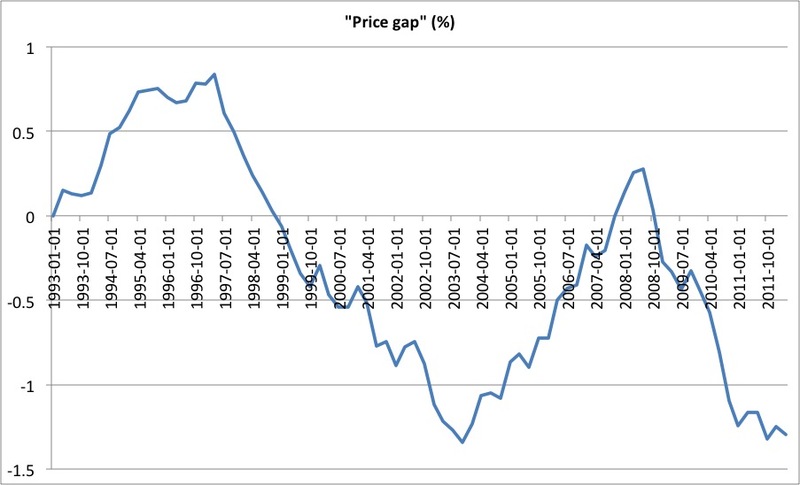 The next graph show the “price gap” which I define as the percentage difference between the actual price level and the pre-crisis trend. 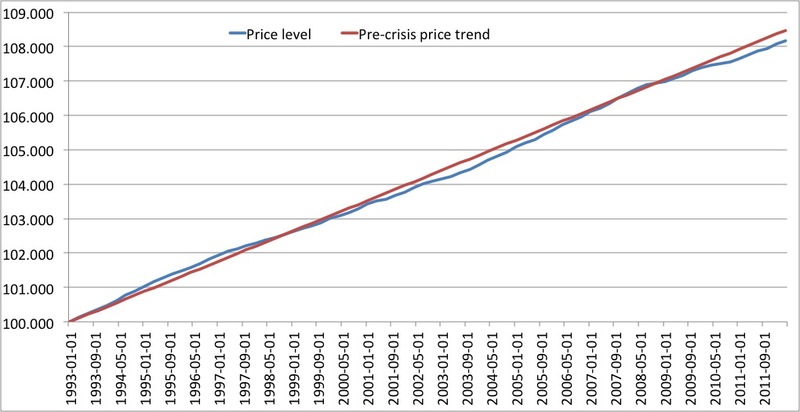 Both graphs are clear – since the outbreak of the Great Recession in 2008 prices have grown slower than the pre-crisis trend (from 1993) and the price gap has therefore turned increasingly negative. This in my view is a pretty clear indication that the demand shock “dominates” the possible supply shock. Compare this with the early 1990s where prices grew faster than trend, while real GDP growth slowed. That was a clear negative supply shock. That said, it is notable that the drop in prices (relative to the pre-crisis trend) has not been bigger when one compared it to how large the drop in real GDP has been, which could be an indication that White, Selgin and Dourado also have a point – there has probably also been some deterioration of the supply side of the US economy. I therefore think that monetary easing is still warranted in the US and I am not overly worried about the recent actions of the Federal Reserve will lead to bubbles or sharply higher inflation. However, I have long stressed that I find it significantly more important that the fed introduce a proper rule based monetary policy – preferably a NGDP level target – than monetary policy is eased in a discretionary fashion. Therefore, if I had the choice between significant discretionary monetary easing on the one hand and NGDP level targeting from the present level of NGDP (rather than from the pre-crisis trend level) I would certainly prefer the later. Nothing has been more harmful than the last four years of discretionary monetary policy in the US and the euro zone. To me the most important thing is that monetary policy is not distorting the workings of the price system and distort relative prices. Here I have been greatly inspired by Larry and George. I think we Market Monetarists should be grateful to George, Larry and Eli for challenging us. We should never forget that targeting real variables is a very dangerous strategy for monetary policy and we should never put the need for “stimulus” over the need for a strictly ruled based monetary policy. And again I don’t think the disagreement is over theory or objectives, but rather over empirical issues. As our disagreement primarily is empirical it would be interesting to hear what George, Larry and Eli think about the euro zone in this regard? Here it to me seem completely without question that the problem is nominal rather than real (even though the euro zone certainly has significant supply side problems, but they are unrelated to the crisis). Update: David Beckworth and George Selgin joins/continue the debate.